It has been nearly three months since my husband took the leap into the world of electric cars, and leased a 2012 Nissan Leaf. 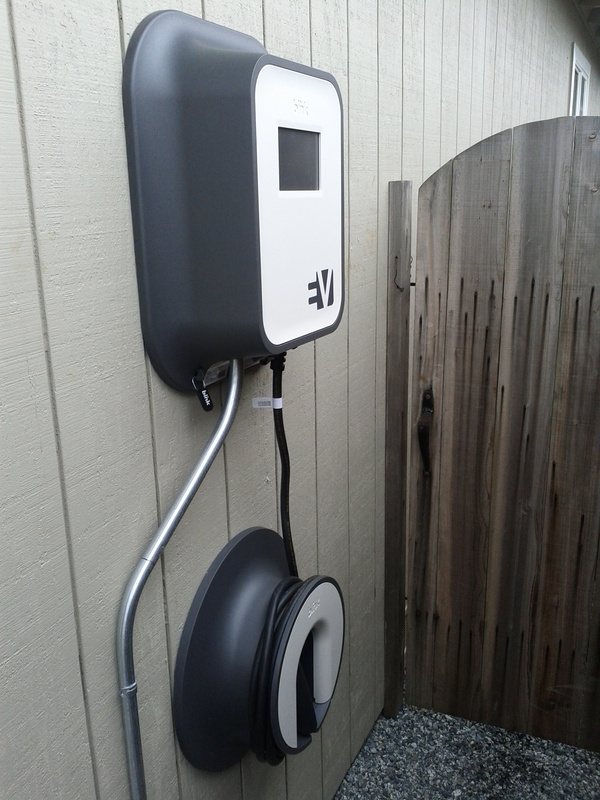 And now, finally the EVSE (Electric Vehicle Supply Equipment) is installed at our home. We have a brand new Blink 240 Volt EV charger thanks to the EV Project. which began in late 2009. Now, instead of charging all night through a household 110-volt outlet (Level 1 charger) the EV will go from zero to a full charge in about four hours with the 240-volt ( Level 2 charger). Yes, you need to learn the lingo, to get by. Start early. Contact an electrician as soon as you know that you are going to purchase an Electric Vehicle. Unfortunately, the EV Project, which provided the charger for free and covered most of the installation costs in exchange for collecting data from the chargers, is no longer accepting applications. However, this also means that you can start planning for a charger now. It took a couple weeks for us to have an electrician come out to give us an estimate, and then, it was nearly six weeks before the electrician sent the estimate, and then, another week before it was installed. Negotiate. Do your homework. We were able to cut the estimate by $350 by negotiating and double checking some of the assertions made in the estimate. For example, we were told that the building department requires that applications be made in person, therefore the cost would be higher than normal, however, after calling the department, my husband learned that an application could be faxed in. We were pleased by the final result, however, it took some back and forth to get there. Shop around for chargers and electricians. Get more than one estimate from a licensed electrician. Our choices were limited by the EV Project which contracts with specific electricians, and also uses only Blink chargers. You will have many more options. This, of course is good and bad. Competition can bring lower prices, but it takes more work to wade through all the options. Seek out advice from your fellow EV owners through dealer forums, and Facebook pages and groups such as the excellent one operated by Plugincars. Nissan Leaf has a Facebook page and if you live in the San Francisco Bay Area, there is a Nissan Leaf Facebook group for Leaf owners. Sign up for an off-peak electric plan with your utility. We expect the off-peak plan to significantly reduce our PG &E electric bill, which spiked after the EV arrived. My husband sets the timer on the charger or the Leaf to juice up after midnight. Off-peak hours vary by the season, the off-peak rates vary depending on how much power you use, but essentially, the more power you use, the higher your rate is. Indoors or out? We chose to locate our charger outdoors for several reasons. We live in a California house (read small and without a basement) therefore our garage is packed with tools, bicycles, golf clubs, and all that other stuff we just can’t seem to part with. There is no way that little Leaf is ever going to find a place in the garage therefore we’d rather avoid having a cord running in under the garage door. Also, if we decide to get generous and open our charger to other EV drivers through PlugShare, doing so would be easier with the charger outdoors. It is fun to share a cup of coffee with other EV owners, but most people probably don’t want them sitting in their garage for four hours. We also had a decent spot to locate it out of view from the street, and somewhat protected from the weather. Living on the coast, we are a little worried about what impact the salt-filled air will have on it in the long run, but time will tell on that one. Then again, we live in relatively mild California. I used to live in New England, and if I was installing a charger there, I might opt for installing the charger in a warm garage instead of battling those cold winter nights outdoors. Any sounds that the charger makes is negligible and therefore was not a big factor in our decision. Costs will vary, depending on the charger you choose, and whether your current electrical system needs upgrading to accommodate the charger, which requires the same voltage as a clothes dryer. When my husband first leased the Leaf, he vowed that with the EV Project, the charger would be free. In the end, it cost us $300. Hopefully, years of hassle-free charging is in the future. Thanks for the story. Am thinking about buying a plugin Prius, so a home electrical connection is a must. While the suppliers are branding these charging stations, are they not simply 240V 16A extension cords? They have no circuit-breakers? They have no charging rate controls? They have no amperage monitors? Or…do they? What is making them worth $1,000 and not $99? Why do you really need an EVSE, instead of just a compatible dryer outlet? Is installing another outlet pretty much the same cost as also getting an EVSE, so why not? OK, but why else? The car already has an inverter and some intelligence. If more intelligence is needed, why not put it into the car? Seems like a useless peripheral that needs to be integrated into the motherboard, to use computer lingo. Thanks for writing. I am researching the differences, and pros and cons of each avenue so stay tuned. Charging a plug-in Prius takes at most three hours on a 110V outlet, so there’s less of a need to install a 240V L2 EVSE unless you need to be able to re-charge more quickly during the day. The EVSE that comes with the Nissan LEAF can be inexpensively upgraded to support 240V charging, and an adapter can be used to plug it into a dryer outlet. I would not recommend doing that if you still need the outlet for your dryer as it will be inconvenient to always be unplugging the EVSE and plugging in the dryer and vice versa. A better solution would be to have an L6-20 outlet installed into which you can directly plug the upgraded EVSE, and it can more easily be unplugged if you need to take it in the car with you. Steve is correct. You can send your LEAF’s trickle charge cord to http://www.evseupgrade.com and they will modify it so that it will charge from either 120 volt or 240 volt plugs. The cost is around $300 plus shipping. It takes about a week to get it back, so you’ll need to make arrangements to charge your car in the interim. They will send you an upgraded cord in advance of getting yours if you pay in advance, so that’s an option. You will need to install a NEMA L6-20R outlet. This is something any licensed electrician can handle. The cost will be dependent on the distance from the electrical panel to where you park you car. As Steve says, there is really little need for a PHEV Prius to install an expensive EVSE. The energy required to fully charge the Prius battery can be easily accomplished with a 120 volt outlet. We purchased an EVSE since we leased the Leaf so did not want to modify the charging cable that came with the car. When the lease is up, can probably still sell the cable @ eBay or Nissan forum for a good price? =p We only do laundry on the weekend so it’s not too much of hassle (un)plugging the dryer outlet. So nice you only ended up paying $300 to get Blink installed! Good job!